A Diamond Grading Report is a statement, issued by an independent Gemological Laboratory, that at the time of evaluation, the Diamond in question has been examined by experienced Diamond Graders, using various gemological instruments, and determined to contain the characteristics as stated in the report. Value or price is not included in a Diamond Grading Report. The grading report reflects quality only, not pricing. The report is meant to be valid long after current market prices have changed. If you want a hardcopy paper to certify value at time of purchase for insurance purposes, you need to get an appraisal. The first item to look for on the diamond report is the name of the lab. such as GIA Gemological Institute of America or AGSL or EGL or PGGL. Look for the labs address and phone number. GIA also has a Carlsbad California Campus as well as worldwide locations. Look for the date the report was issued. Look for the certificate number. The Lab keeps an internal copy of everything which you see on the diamond certificate, plus some additional information for their files. If you call up the Lab and give them the certificate number, they can verify and even reissue a certificate (report) if you lose it. Look for a laser inscription. The laser inscription registry refers to the fact that all diamonds receiving a GIA Diamond Dossier® is micro-laser inscribed with its unique GIA Report number. The rest of the report is all about the unique features and characteristics of the diamond. All aspects of the stone should be described. Shape refers to the outline of the diamond. Examples include: Round, Pear, Heart and Oval. Cutting Style refers to the facet arrangement. Examples include: Brilliant, Marquise, Emerald, Princess, Step and Mixed. Weight: Diamonds are weighed to the thousandth of a carat with a digital measuring device. On the grading report, weight is rounded to the hundredth of a carat. Example: 0.51 carats. Color: Color ranges from the best grade of D, down to Z. After Z are Fancy Colors. Color grade is determined by examining the Diamond next to a master set of color comparison stones, under special lighting. Example: Color Grade - E.
Finish describes the polish of a Diamond and how symmetrical, or how evenly, the facets have been placed. Polish refers to the quality of the polish on the facets. An excellent polish reflects the care taken by the Diamond cutter. Symmetry refers to how precisely the facets are aligned to each other. It is easy to detect this property with a loupe. Look at the table of your Diamond. Does the right side look like a mirror of the left? Example: Polish - very good. Symmetry - very good. Fluorescence refers to a Diamond's reaction to long wave ultraviolet radiation. If a Diamond has too much fluorescence, some feel strong fluorescence can make a Diamond less desirable. Examples: Fluorescence - NONE or faint blue or strong blue. Each Diamond is as unique as a fingerprint. By plotting its characteristics, and combining this with the physical measurements of a Diamond, a Lab can uniquely identify each stone. 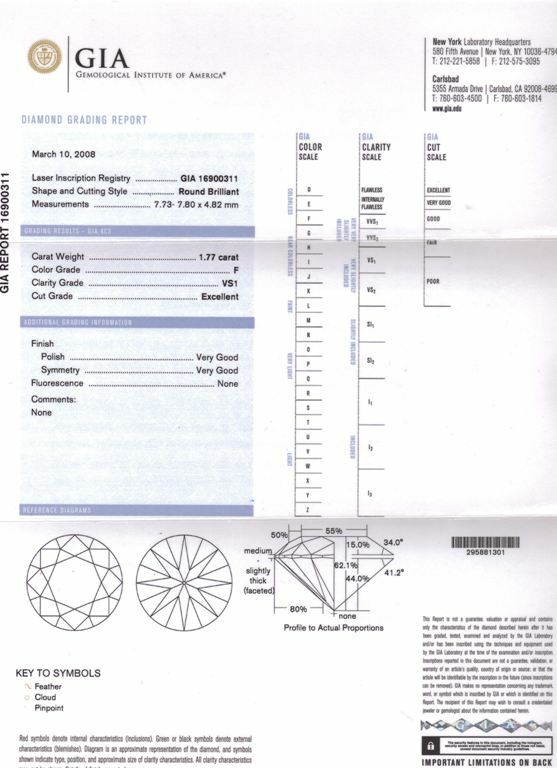 A plot or diagram image of the stone helps the Grader in the event that a customer returns to the Lab and requests a verification that the Diamond presented with a certificate refers to the same Diamond described in the Certificate. Internal characteristics are plotted in red, and external characteristics are plotted in green. Security: There are several security features in place to make it hard to forge a grading report, including UPC (bar) codes and a hologram or watermark in the paper. If you want to make sure that a diamond matches the grading report, have an independent appraiser, one who does not sell diamonds, verify the report for you. The reason the appraiser needs to be independent is so that there is no conflict of interest. An appraiser who would love to sell you a diamond is less likely to be fair to a diamond you bring in than someone who doesn't sell or get a commission for a diamond sale. The Girdle of a Diamond is the dividing line between the crown, or top part of the stone and the pavillion, or bottom part of the stone. Girdle thickness can be very thin in part of a stone and very thick in another part. That is why it is expressed as a range. The girdle can also be faceted, or not. A faceted girdle usually improves the look of the stone, and involves having the cutter polish facets into the girdle. You may also see some diamonds with a laser inscription right on the girdle. It is relatively inexpensive to have a custom message inscribed and it doesn't affect carat weight. Example: Girdle - medium to thick, faceted. agslab.com AGS Laboratories is among the best known and well respected diamond grading laboratories in the world. www.eglusa.com EGL USA is one of the world's premier independent gemological laboratories.